Another year gone and the kids another year older, tougher, and more capable. Also, more independent and less interested always in coming out with us to the mountains. Nevertheless, we had a few good family trips this year. Of course, the ski spectacular that was the 2017-18 ski season got us off to a good start. First up was a two night trip to Fruita in early June… though the highlight of the trip was definitely a hike up to the legendary Hanging Lake in Glenwood Canyon on the way there. All these years driving past, we’ve never stopped at Hanging Lake, but this year we finally did. It’s definitely a tough hike for the length, but the lake at the top (as well as the spectacular Spouting Rock just past the lake) is spectacular. There was grumbling on the way up, but none once we got there. The Hanging Lake trail does not fool around. Hanging Lake. Photos do not do this place justice. Spouting Rock was surprisingly cool. The highlight of Fruita was definitely scrambling through lots of narrow canyon squeezes and exploring rough areas above the Devil’s Kitchen in Colorado National Monument. We saw approximately 40 lizards of different types as well as some blooming cacti. Half the fun of micro-hiking is seeing what you can squeeze yourself through. What’s cooking in the Devil’s Kitchen? Two weeks later, we headed out again to Redstone, a previously unexplored area, for two nights exploring the mountains west of Aspen. After a hot start, the weekend turned extremely rainy and we got very wet. We attempted to visit the Yule marble quarry (emphatically closed despite what our hiking guides said). We still got in a nice hike and spent time exploring the town of Marble and its storied history as the purveyor of high-quality white stone. On the way home, we took the kids to the iconic Maroon Bells… the bottom two thirds of which were visible below the clouds. Ah well. Redstone with cool clouds before or after one of the torrential downpours. The retaining wall at the end of the road was as close as we got to the Yule marble quarry. Still, these “waste” blocks were pretty impressive. Plan B hike into the Raggeds Wilderness was also nice. The Raggeds look very interesting… but not for today. 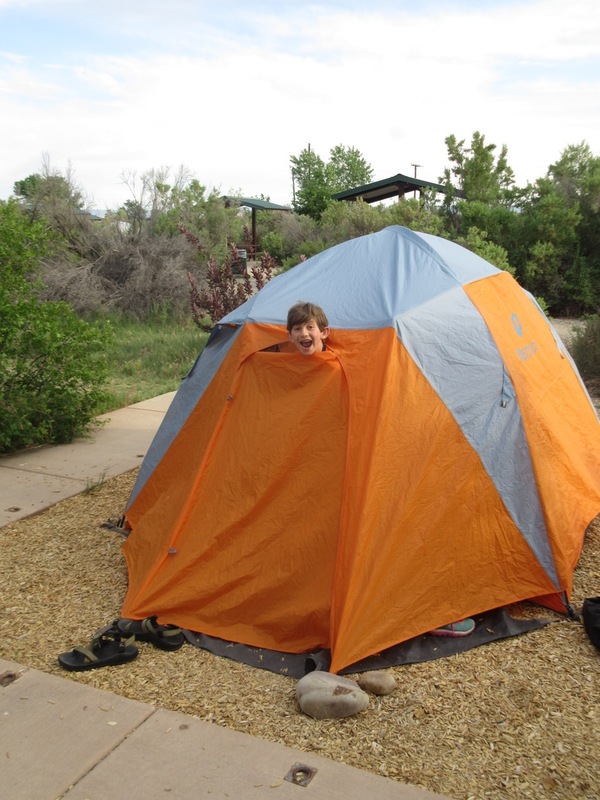 In July we “glamped” with two nights at the YMCA Snow Mountain Ranch. There was summer tubing, llama trekking, canoeing, ziplines, mine exploring, and various other fun. Not exactly wilderness camping, but definitely high-quality family fun. Trekking with Liberty the Llama. Someone was convinced there was gold in them thar hills, so he tunneled about 150′ through solid granite. No gold. Dad and Daughter hike up to a nice little waterfall. Everyone looks baffled at how Dad managed a hole-in-one at the self-service minigolf. We rounded out the camping season with a trip in August to Steamboat Lake State Park with a bunch of other families (five? seven? I honestly can’t remember, but there were a lot of kids!). Again the weather was mixed, but we got in a good bit of boating both on Steamboat Lake and the nearby Pearl Lake. The highlight of the long weekend was a successful ascent of nearby Hahn’s Peak. We attempted this one back in 2016 and had to turn back because of weather, but this time we made it to the summit and the spectacular views all around. Well worth the tougher-than-expected hike! Steamboat Lake with Hahn’s Peak under ominous skies. Thank goodness she was helping me paddle the big boat or we’d still be out there. Compared to previous years, we didn’t manage as many tent nights or as ambitious destinations. But we still had plenty of fun and adventure (and misadventure) and we look forward to more of the same in 2019. Lunch at Officer’s Gulch on our way… somewhere or other. This entry was posted in exploration, family, peak, retrospective, travel, water and tagged canoeing, colorado national monument, devils kitchen, fruita, glenwood canyon, hahns peak, hanging lake, james robb, llama, marble, maroon bells, redstone, snow mountain ranch, spouting rock, steamboat lake, tubing, ymca, yule quarry, zip line. Bookmark the permalink.